What they do all day? It's not just about the eye charts. Optometrists do everything from helping patients get the right prescription for glasses, to treating red eye, to diagnosing serious eye diseases. They typically work in a medical office but might also work in a hospital or retail outlet (think LensCrafters). How to get the job? 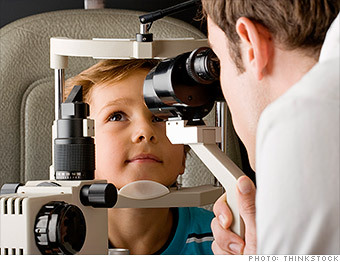 Much like M.D.s, optometrists need a four-year post-graduate degree, as well as a license. Some students also do a one-year residency to develop a specialty or boost their experience. What makes it great? Good pay, without the frequent long hours and middle-of-the-night emergency calls doctors expect. Patients typically aren't in pain or afraid, so visits tend to be low-key, and many stay with the same optometrist for years. What's the catch? That four-year degree? It's not easy or cheap. And depending on the setting, working evening and weekend hours may be part of the job. --K.A. Do Optometrists have great jobs, or what?